Y’all know I love a good deal. So let’s start off with some deals I found when scouring internet land last night. 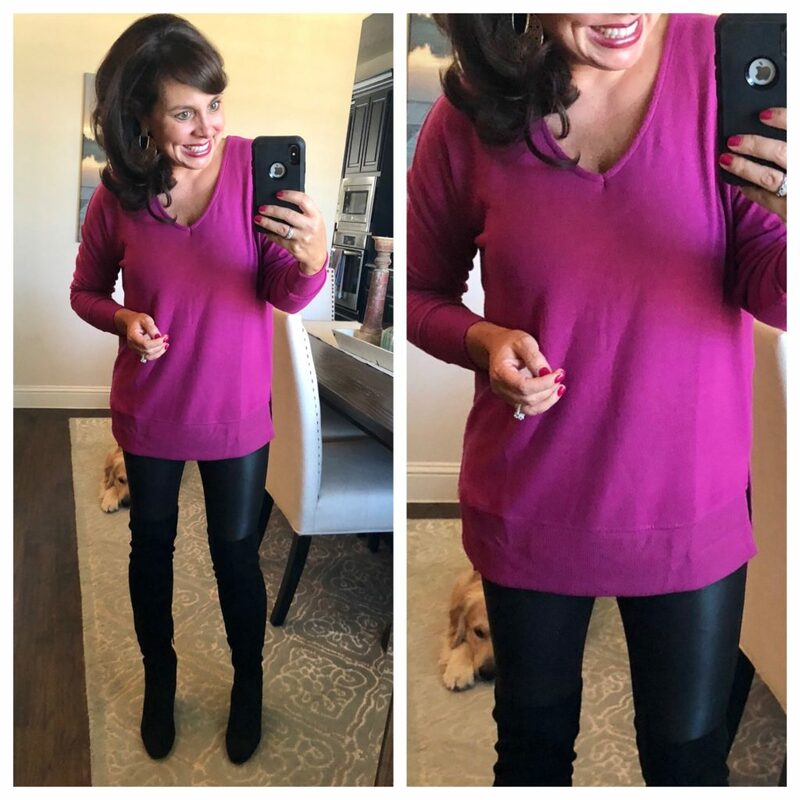 ***This cowl neck tunic sweater comes in several colors and is on super sale. I love the crumb color and the wild olive the most. This pink peplum utility jacket is 40% OFF! It only has 1 review, but it looks absolutely darling! I love their mixed media sweaters, and this one is a great one. Even the signaturesoft pieces are 40% OFF! Thanks for the tip, Lauren! Click HERE for all things leopard (there’s a great sweater and an awesome pair of pants)! ***J Crew is 40% OFF coats, sweaters, and boots! And it includes this fleece half zip pullover, I love the Kelly green and blush (and the stand up collar). ***It’s ANTHRO DAY! FREE SHIPPING on ALL ORDERS (no minimum!) and 25% OFF EVERYTHING! I’m smitten over this ribbed turtleneck sweater, and I’m totally swooning over these statement earrings. 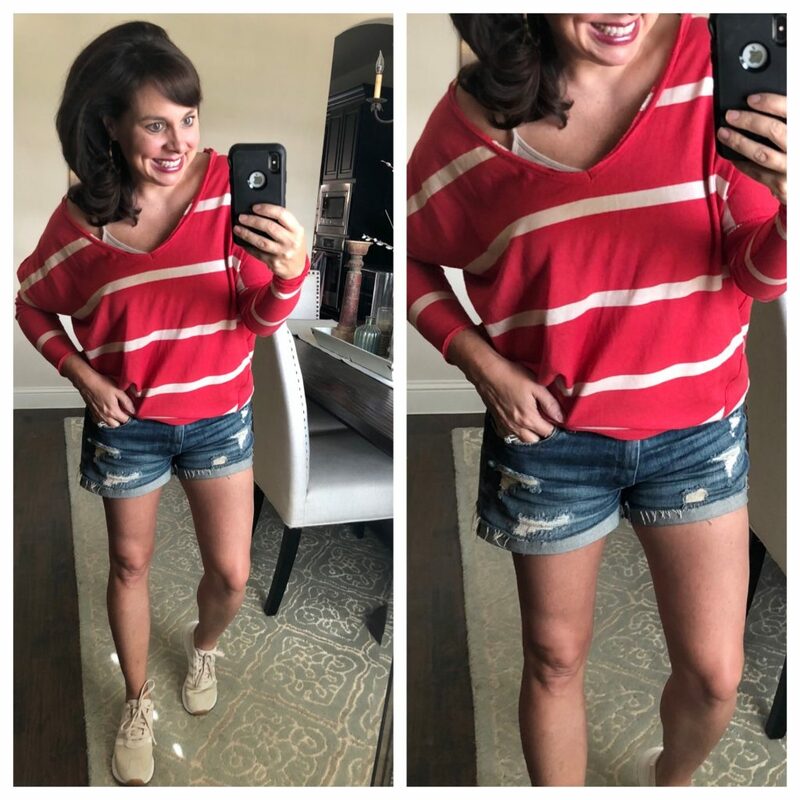 Next up I have a couple of new items that I’m loving…as well as some favorite old things that I’ve pulled back out (that are still in stock!). This top is ONLY $39, and it’s a perfect light layer. The site description says it’s a sweatshirt, but it’s definitely not a sweatshirt. It’s more like a thin sweater. 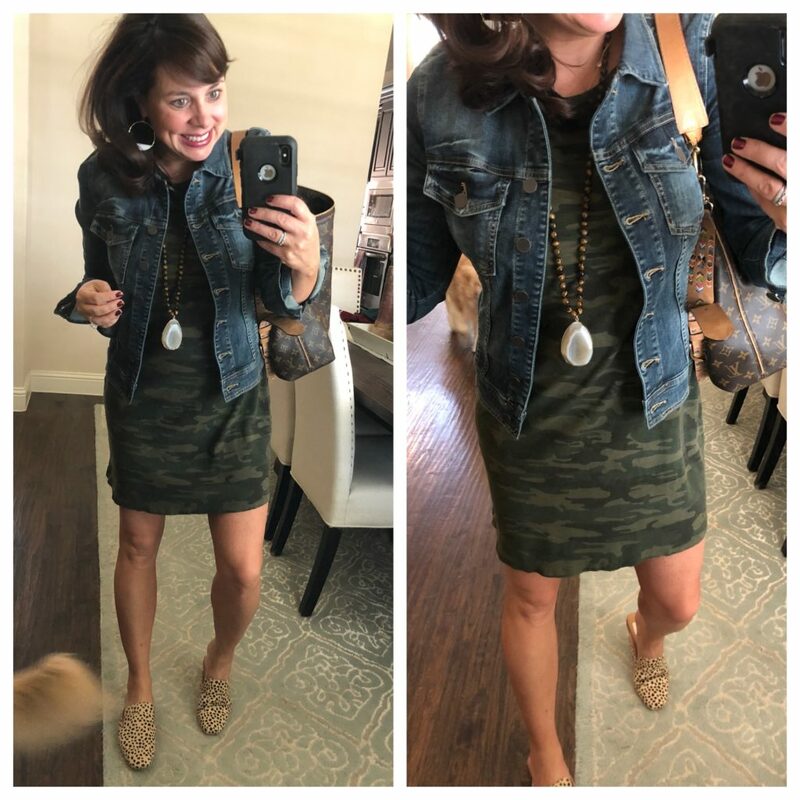 I’ve worn it by itself and layered it under my camo military jacket. On the left, you can see it with the band tucked under. On the right, you can see it pulled down. I sized up to a medium for a very relaxed fit. My new denim jacket (from the same maker of the must have jacket I named a favorite 4 years ago) is definitely a new favorite. 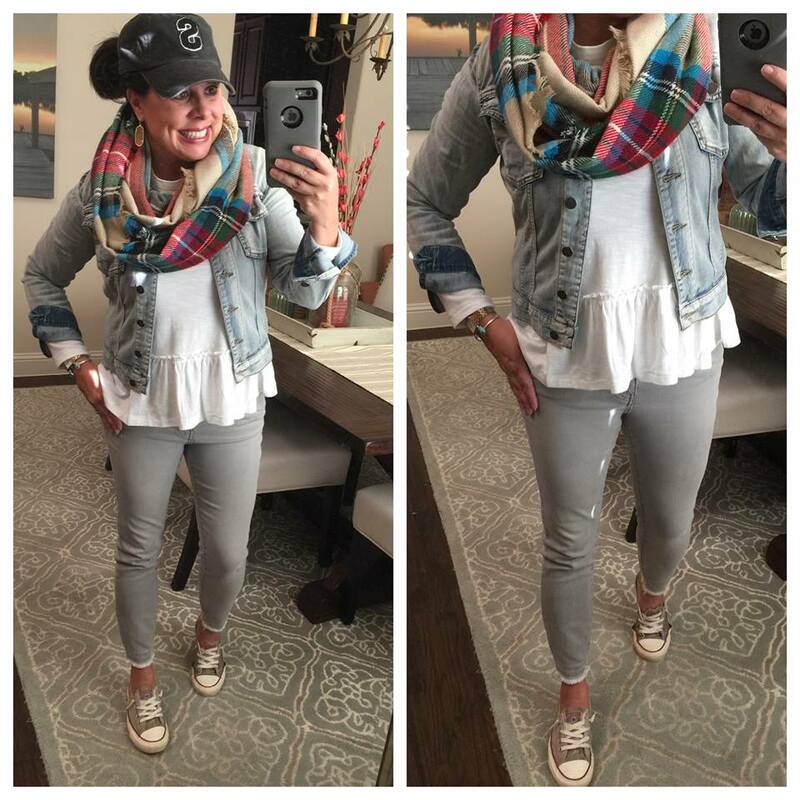 It’s a bit more of a relaxed fit, and I love the darker wash. I’ve worn it 3 times this week. Here’s the new denim jacket. Again. And I HIGHLY RECOMMEND the jacket, the jeans, and the boots. 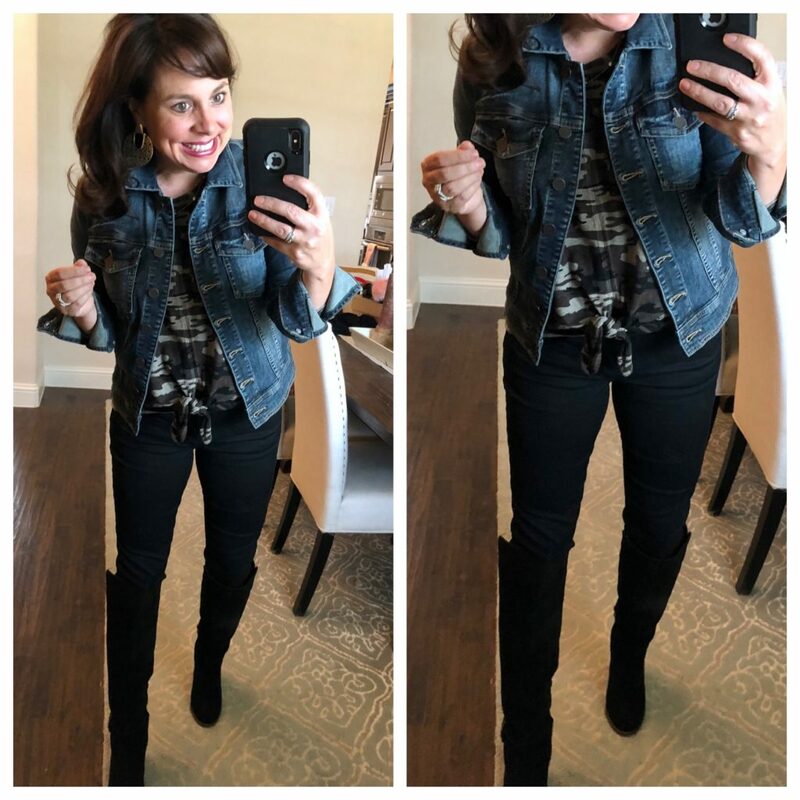 Everybody needs a pair of black jeans that make them feel great… and these are so flattering, comfy, and an awesome price! For size reference, I’m wearing a small in the sweater, a medium in the jacket, a 4/27 in the jeans, and the boots are true to size. This is the tee from last year that I named the “like buttah” tee. Because y’all. IT’S LIKE BUTTAH. It’s longer in the back than the front, you can wear it out or 1/2 tuck it, and it’s perfect on it’s own and to layer. And yes. 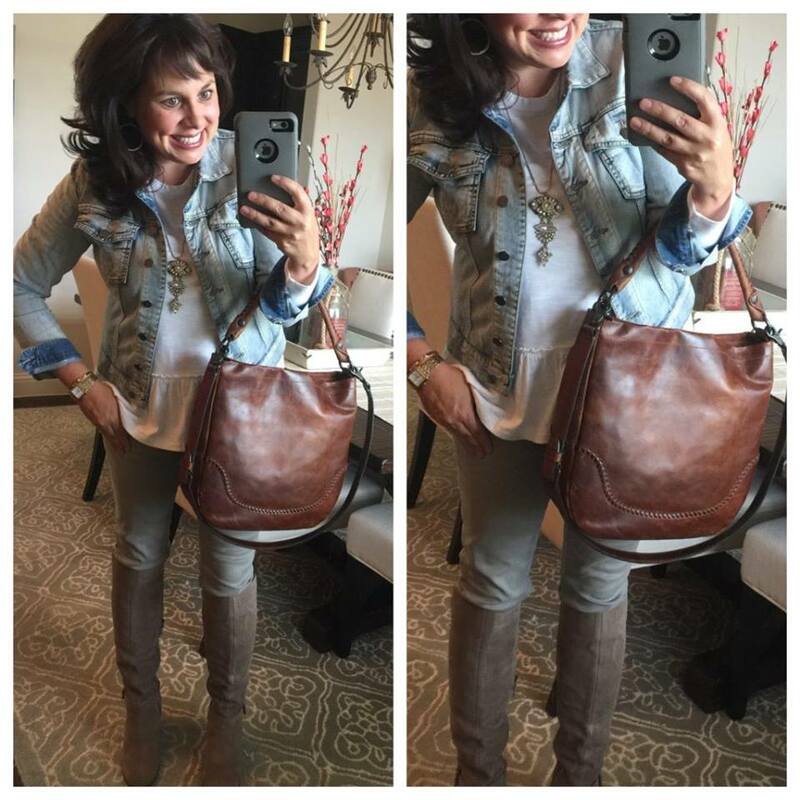 I’m wearing these Sam Edelman jeans again. I mean. Who knew that Mr. Edelman was going to make a pair of jeans that I adored? I mean, he made me a believer with his Felicia flats, and I love him even more now with these jeans. 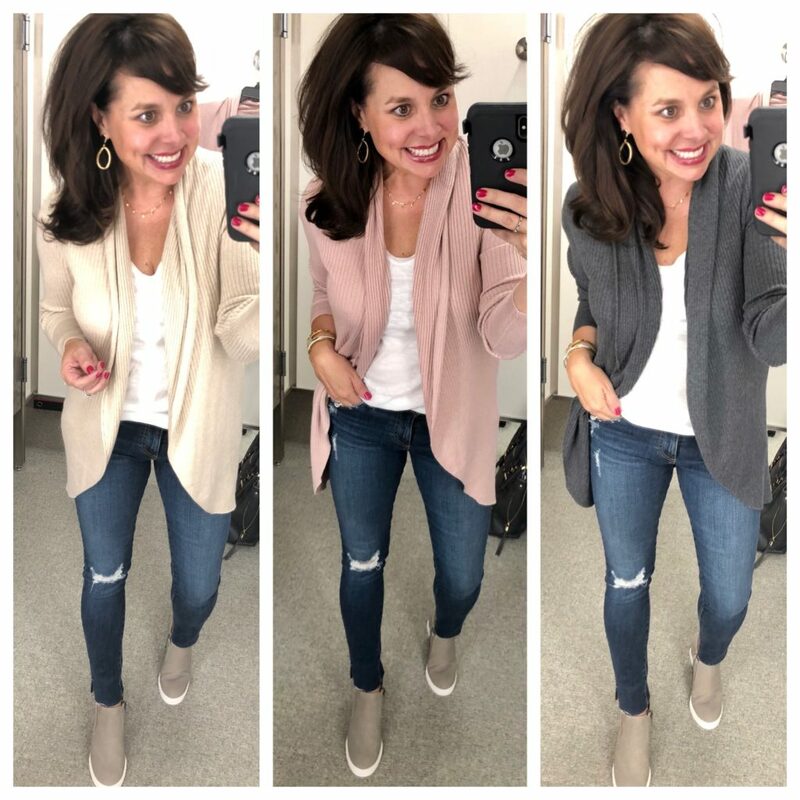 One of my favorite cardis is BACK IN STOCK in all the colors (8 colors total now!) and all the sizes! Thought y’all might want to know! SALE ALERTS! SALE ALERTS! SALE ALERTS! SALE ALERTS! SALE ALERTS! I always love it when favorites from previous years come BACK IN STOCK. And I especially love it when those favorites are ON SALE! 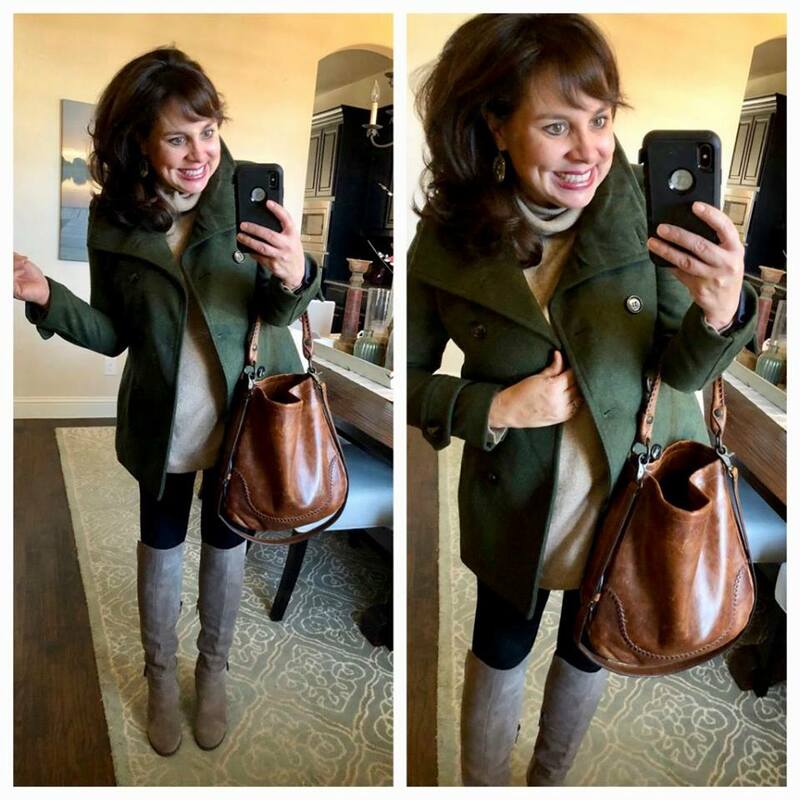 I know so many of you already have this pea coat. And I know lots of you have it in two colors! I’ve had it in olive for a couple of years now, but the camel is calling my name. SIZE UP. THIS CLASSIC PEA COAT is ON SALE FOR ONLY $37.90. 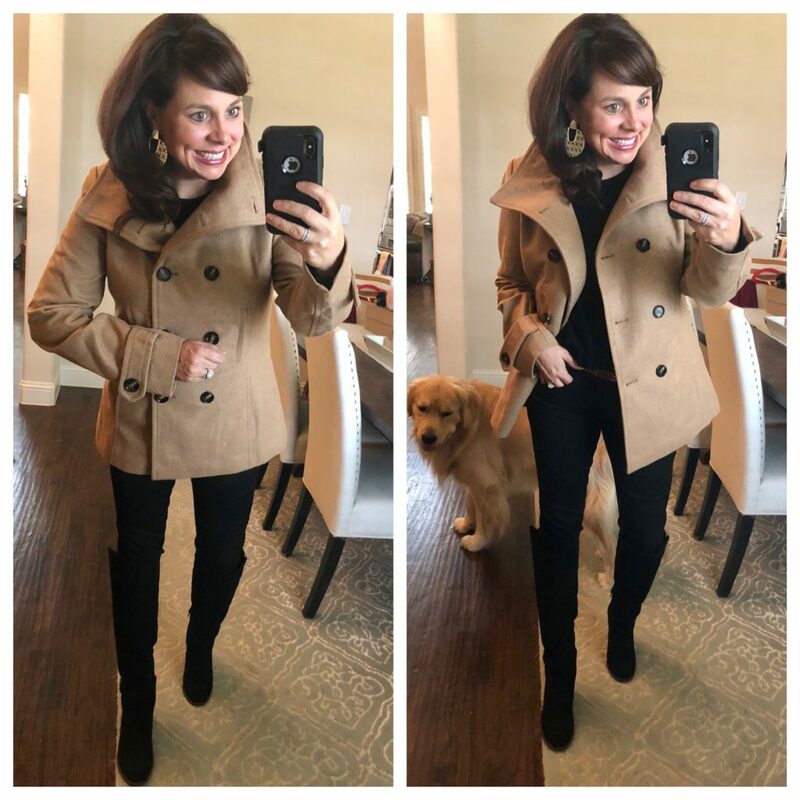 So…I started writing this post on Monday….and I went ahead and ordered the camel colored coat on Tuesday. I was powerless against the UNDER $40 price tag. It came yesterday, so I had to put it on for y’all to see! I can’t believe the quality for the price. And the collar and the cuffs are so classic and cute. I know I told you a second ago to size up, but you realllllly need to. I’m in a large. It says a large is a 6-8, and a 6-8 would be what I would normally order in a coat…but usually a medium would be a 6-8. 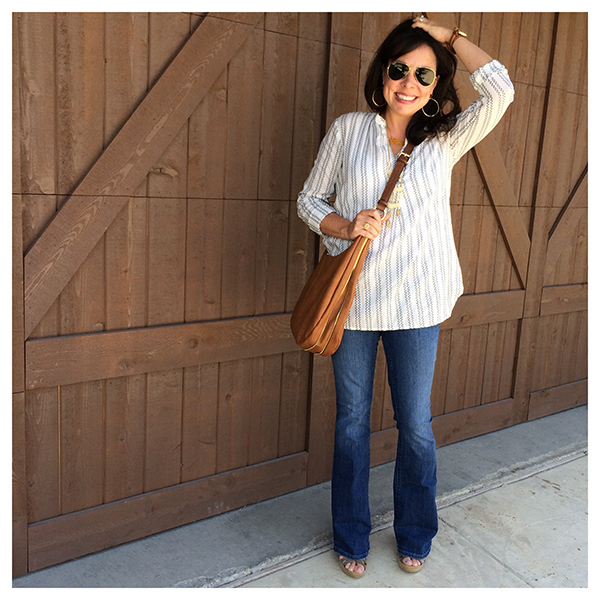 This tunic tee is perfect for layering AND ON SALE for $15.20. It’s pretty thin, so I don’t wear it on it’s own, but I wear it under all sorts of jackets. It half tucks easily, but it’s also a great length for leggings and a long cardi. 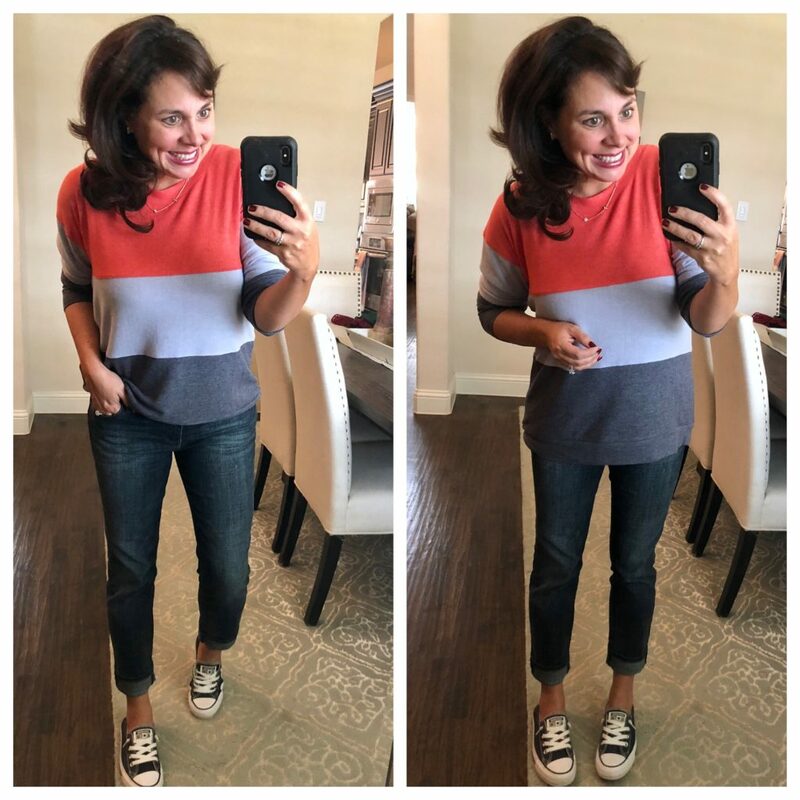 These jeans are from last year (SO STRETCHY AND COMFY! ), and they are still in stock! 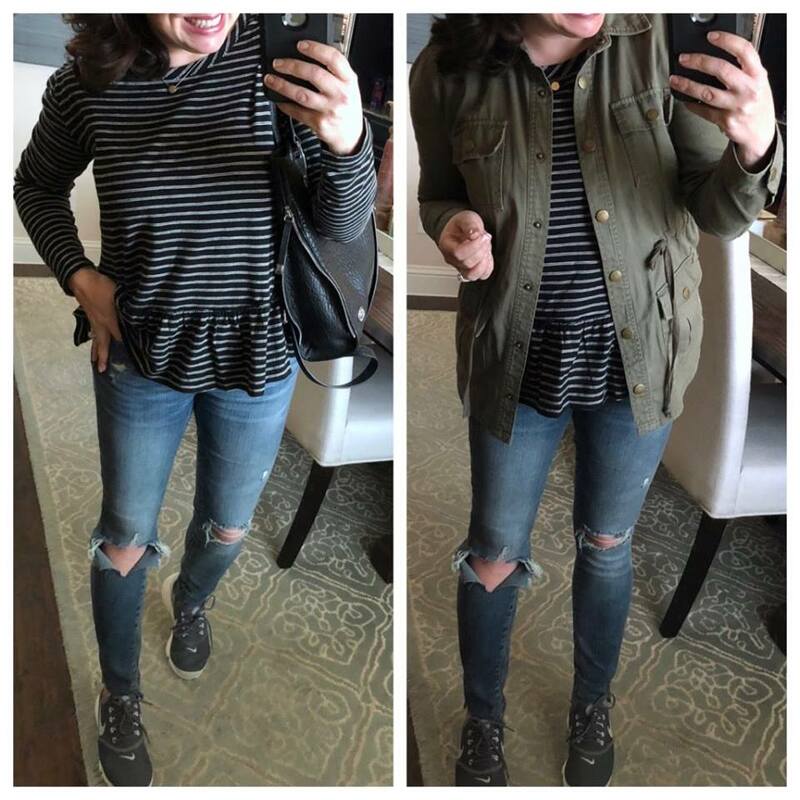 Last year I bought a peplum tee in 3 colors, and it’s back this year and NOW ON SALE for UNDER $20! Some colors are gone, but there are some new colors too. 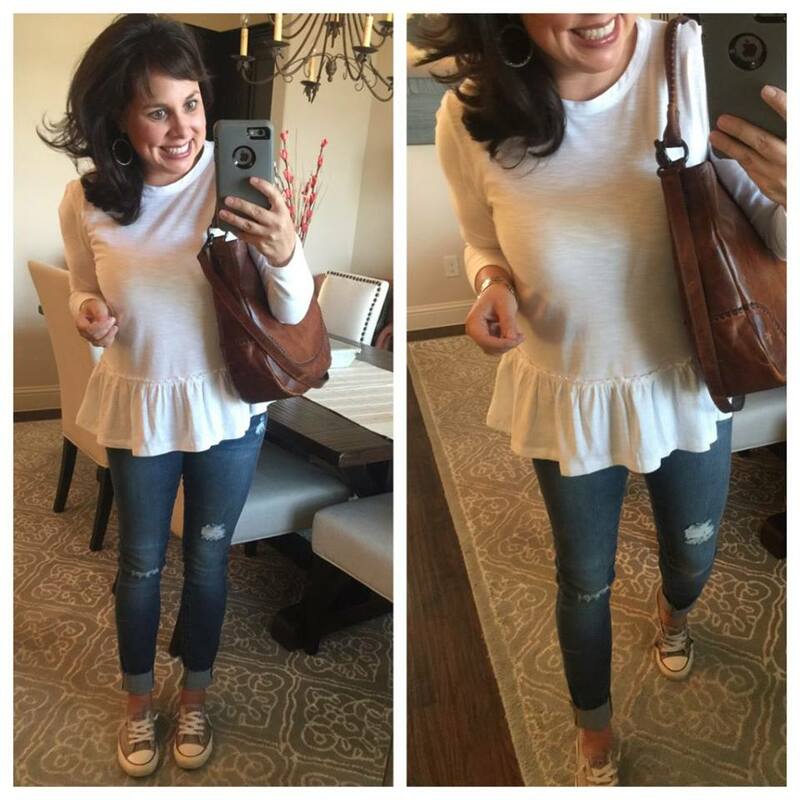 Click HERE for the peplum tee that I’m about to see you in the next several pictures. I’m wearing a small. And here’s the white tee styled again. And again. As you can see, it’s a great staple. Especially at this price! This striped one is still available too! This wine color is no longer available, but I wanted to show you this pic to show you how cute the tee is with boot cut jeans too! If you don’t have these jeans yet, GET THEM. Trust me. Get them. This top is also from last year, and I still wear it. A lot. AND IT’S ON SALE! Another awesome sale item is this hot pink top. It’s ONLY $33 right now! On the site, they call it a sweatshirt, but I think it feels much more like a thin sweater. It comes in 5 colors, and I was drawn to this electric pink (but they call it purple). 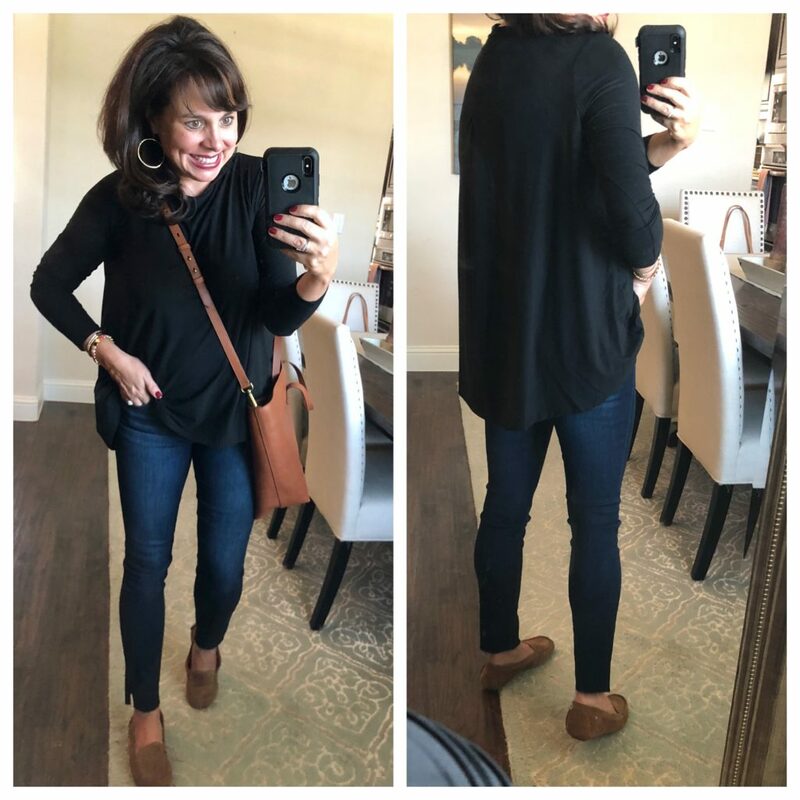 I’m wearing my regular small, and it’s plenty long and roomy to wear with these FABULOUS leather leggings. I cannot wait to style these leggings a million different ways! The top will also look great worn more casually with jeans. Okay, ladies. This is HUGE. First off, I want to let everybody know that they’ve revamped the Discovery Kit, and it comes in a new quilted bag! 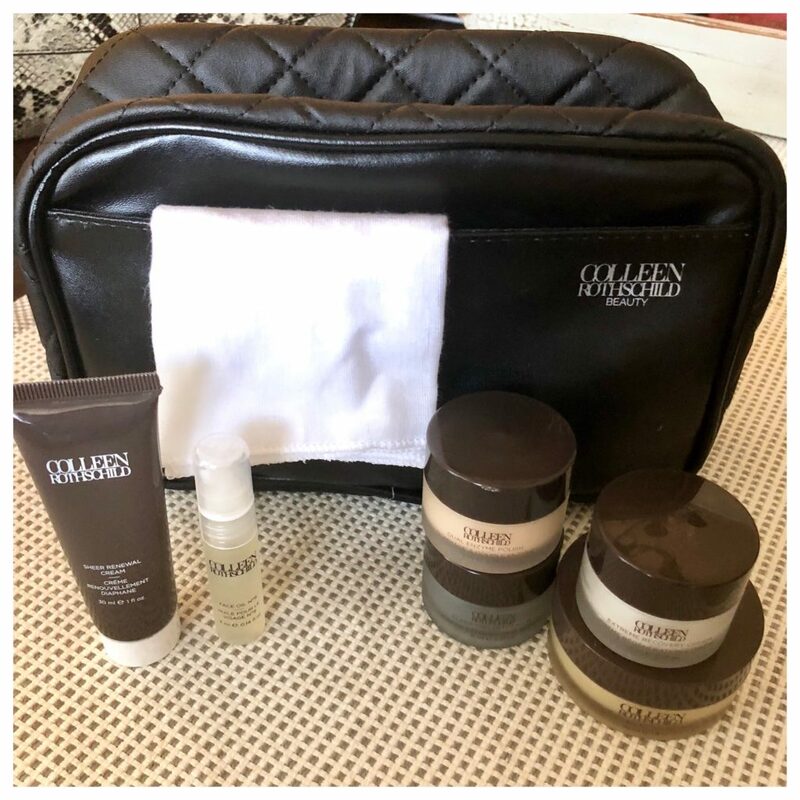 As always, if you already know and love the brand and want travel sized products, you need to check out the Discovery Kit (that’s already a reduced price) for an additional 25% OFF right now! OR if you’ve wanted to try some things, but haven’t known where to start, this Discovery Kit is a great option for you too. It contains many of their most popular products and would be a great way to give them all a try! I’ve had many readers say that after giving the Discovery Kit a shot, they are now loyal users. With the exception of the face oil (it’s a bit to oily for my skin, but my mom absolutely swears by it and says her skin “drinks it up”), I absolutely love everything in the kit. 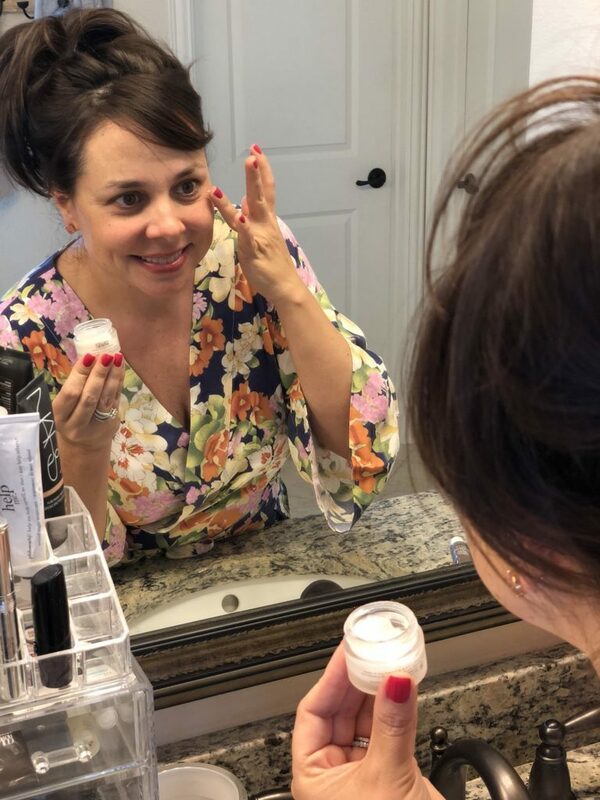 (Speaking of my mom, if you want to see her favorite skincare products, click HERE for her very thorough review! Click HERE for the post that I dedicated to my skincare routine. Colleen Rothschild herself actually listened to my concerns, and then recommended products to me! COLLEEN ROTHSCHILD TOLD ME TO, Y’ALL! If you’ve even been considering the possibility of trying out new skin care or even just starting a skin care routine, I highly recommend checking out this post. My mom shared her thoughts on her favorites too. Click HERE to get to my mom’s post. Last time I posted about the spray it SOLD OUT. Well, it’s BACK IN STOCK!!!! And even the travel spray is back in stock. I have received at least 50 messages from people who bought this and were absolutely gobsmacked at how well it works. Words like “unicorn magic” were thrown around. I have another READER QUESTIONS post coming up in a couple of weeks. I tried to solicit questions on ig stories, but there was a glitch and nobody could type in a question. I’ll try that again over the weekend, but also feel free to leave questions in the comments section today! So many of you are praying fervently for Holt, my cousin’s son. And many of you also contributed financially (either through the Go Fund Me, through the Holt necklace, or through t-shirts). THANK YOU SO MUCH FOR YOUR PRAYERS AND YOUR FINANCIAL SUPPORT. I cannot tell you how much it means to the family. His first round of chemo was super rough on him, but he’s actually doing well this week! Click HERE to read my original post about Holt if you missed it. 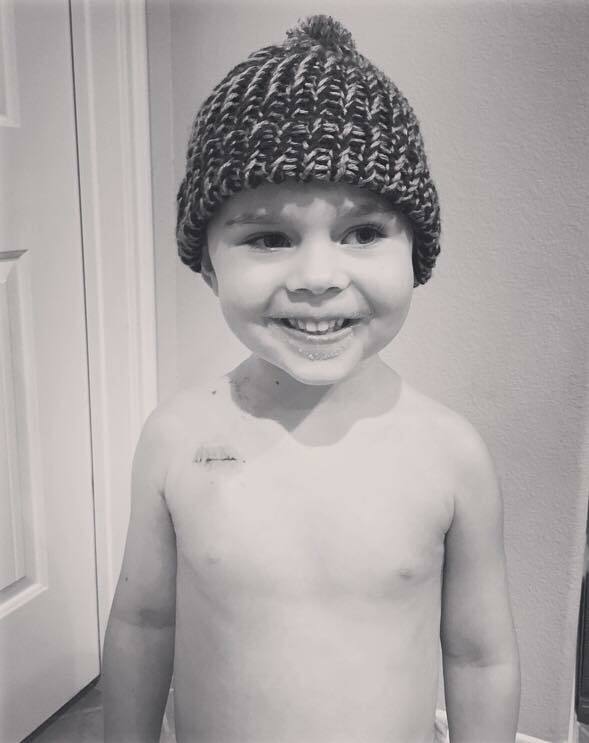 Click HERE to get to the CaringBridge page where Alden does a beautiful job of keeping everybody updated on their sweet boy. Click HERE to to get to their Go Fund Me page. 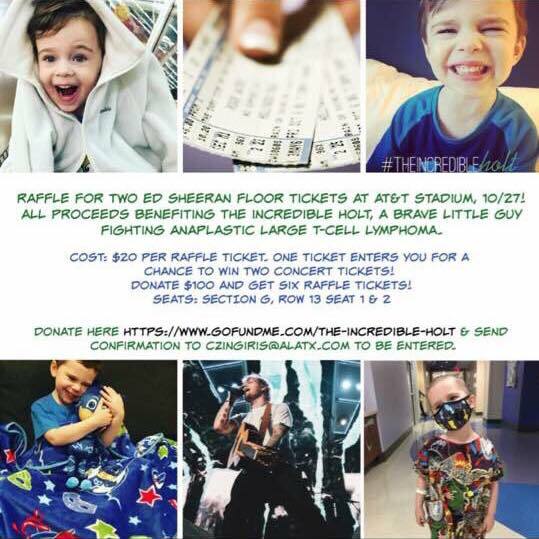 I wanted to remind everyone that if you’re wanting to enter the raffle for the Ed Sheeran floor tickets for his concert at AT&T Stadium on October 27th, you can still do so! 1. Donate through the GoFundMe page HERE. Whew! That was a long post today, but I hope you enjoyed it and maybe scored some great deals! Ps- I have come to love this organization. You should see about collaborating and doing a post with them! They now sell way more than just hats! 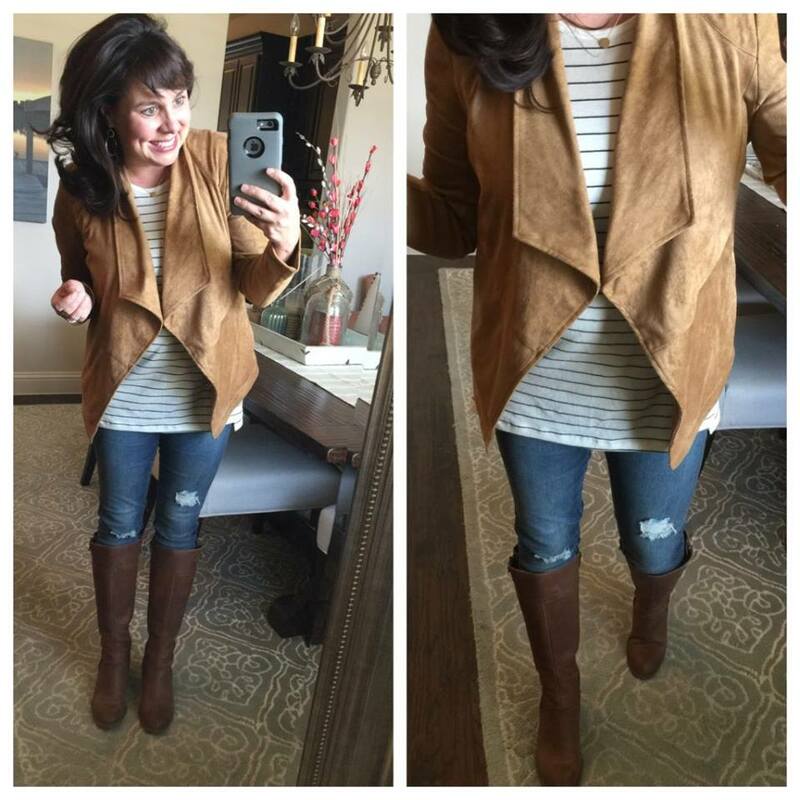 I tried on the suede jacket thingy and it was seriously like BUTTER!!! It blew my mind! Praying for Holt and his family every single day. Thank you for the updates!! Happy Friday!! This post fULL of CUTE finds almost all on sale just made me happy! I need that wrinkle releaser in my life! Praying for a cure for that sweet boy! Just bought that wrinkle spray because I’m hoping it will be awesome for traveling and delicate fabrics that don’t do well with an iron. I tried a steamer, but it just didn’t make much of a difference. Thanks for the 10% off code! Continuing to pray for Holt since you told us his story, and I follow his Caring Bridge site for updates. He’s a precious little boy. 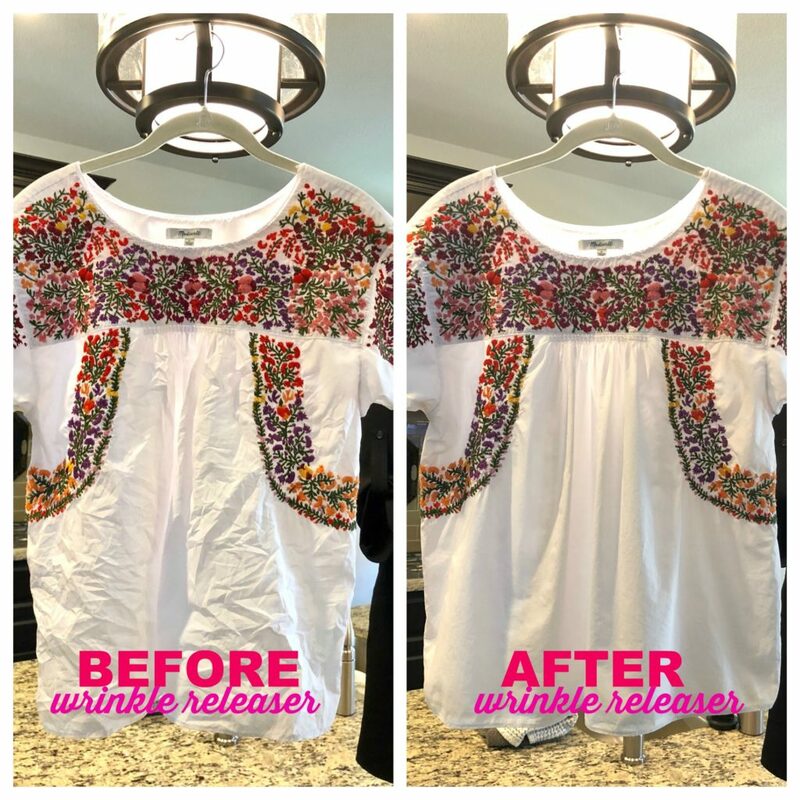 Holy smokes those are some amazing sale finds….and darling outfits!!! 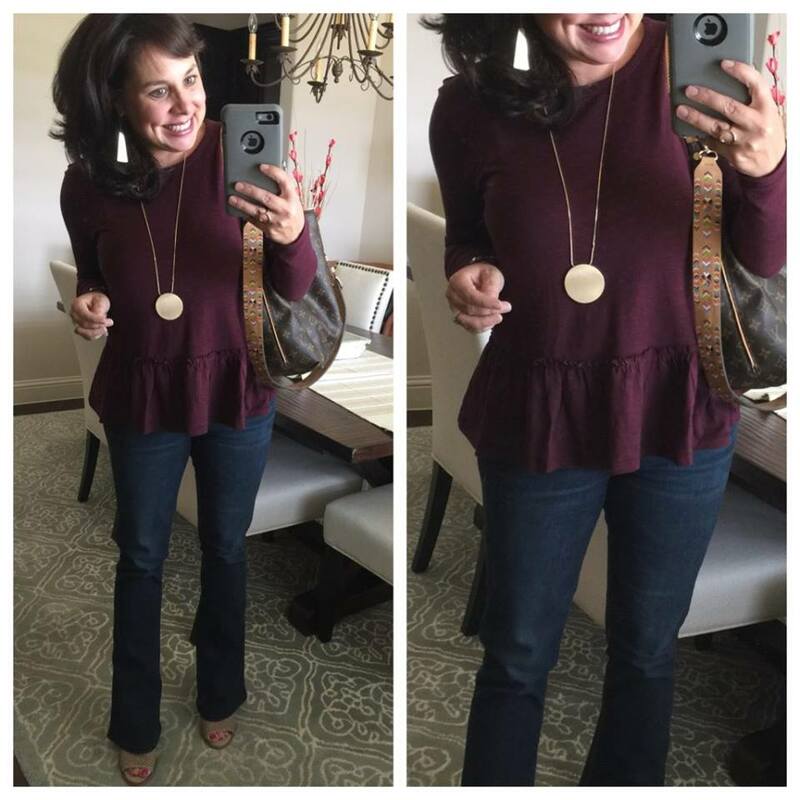 I purchased the Peplum Tee in gray, white and pink – fabulous staples! We’re heading to Sonoma and San Francisco for a week and these are going to be perfect as we are only taking carry-on!!! They are so comfy and much dressier than a plain tee! Thank you!!! I purchased the peplum shirt, and while I really like it, the wash instructions scare me. Are you really hand-washing it as instructed?